Nature of the walk : Easy tracks and some rough damp trackless pasture on the Open Access land. The permissive paths on the Greystoke Estate have a blanket 'NO DOGS' clause. It is imperative that no one contravenes this, as they will be putting all permissive path access in jeopardy. PARK In the large car park behind the village hall and associated with the open-air swimming pool. Greystoke is situated four miles west of Penrith on the B5288. A vibrant tone of grey permeates through this walk, derived from the underlying bones of carboniferous limestone. This distinctly non-Lakeland rock crops up variously to offer up many surprises in this seven-mile loop on the doorstep of the National Park. As one leaves the village street and passes through the stone-arch to the Greystoke Castle Estate one truly enters another world. A kind of enchantment takes hold. The wonky logic the led the estate to consider erecting wind turbines of the breezy wold of Berrier Hill understandable when one views the world from ‘within’ this secret landscape. The outrage of the wider community must have come as a shock. Yet however secret and lost the land may seem from within, the traveller at large witnesses the hill-scape setting as an integral threshold component of a brewing and majestic Lakeland Fell landscape. But let’s not harbour on potential future woes. Enjoy, for now, what centuries of man’s positive involvement in a landscape has created under nature’s stern dictate. The attractive estate village of Greystoke has a lively pub the Boot & Shoe, a village PO/shop and a lovely little parish church, with much of St Andrew’s basic fabric deriving from the C13th. Currently proudly standing on the triangle of green short of the castle lodge is a sign stating this to be ‘Eden’s Best Kept Large Village’, well done all you Greystokians, it’s a well-merited accolade. Greystoke estate shepherds considering which gates to close after shifting a flock from one pasture to another. Note the NO DOG clause obviously does not include working dogs belonging to the estate. Do not be deterred by the notice stating that Greystoke Park is not open to the public, it is! To qualify, there is a formally agreed lattice-work of permissive paths and on the higher ground open access, so you have no cause nor need to feel unwanted. 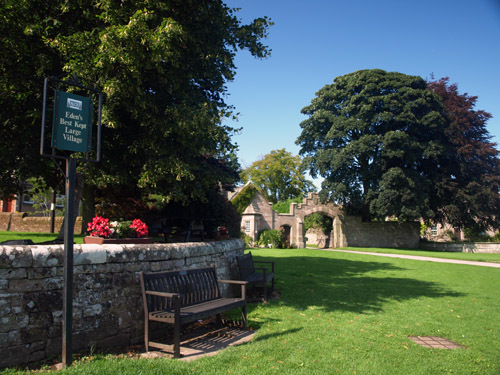 The County Council’s Countryside Access Team has set out the necessary furniture within the Higher Level Stewardship Scheme - though the signage needs further attention within the context of this walk. 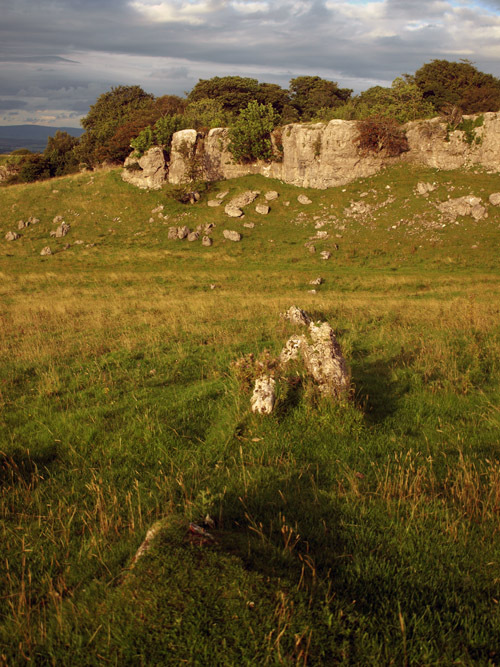 The walk described here is set to become one of a series of formal Open Access Walks I am to prepare for the County Council – in the form of downloadable PDFs. 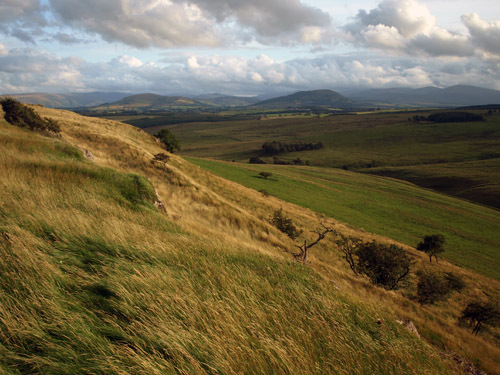 Five Open Access Walks have already been prepared to launch the programme and these will become available by the end of August - track down on either www.markrichards.info or the Cumbria County Council Countryside Access websites. Stride on along the drive and immediately after crossing a stone bridge the drive forks. Ahead one may catch a glimpse of Greystoke Castle, an imposing pile, the main part of mid-Victorian construct, a neo-Elizabethan mansion. Lurking to the right at the rear the medieval pele tower which William Lord Greystoke was given licence to crenellate in 1353. The great house has been in the Howard, Dukes of Norfolk family line since Adam was a lad. The swing right via the cattle grid and hand-gate and follow the open track through the park, this curves left and crosses another cattle-grid entering a fenced lane where the track branches three ways. Stride on through the Home Farm building complex. From the gate beyond the barns pass a pond, originally dammed to provide hydraulic power to run a sawmill in the barns. You’ll question the gate, looks an unlikely position, one can hardly drive a tractor into the pond! By this access water is extracted to rinse out slurry tanks! As the track forks, swing left to a go through a gate. Keep with the track, fenced to the left, by another gate and passing a bedraggled dutch barn, keep forward as again the track forks. 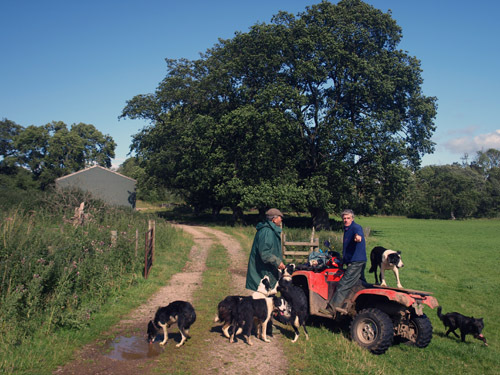 Pass by three further gates below the young plantation of Old Nab Wood, to come by sheep pens and barns, known to estate shepherds, tongue in cheek, as the Sheep Hospital! Follow on due west with the gently rising fence to your left. Short of the next intervening fence, and after the triangular enclosure on the left, go through the gate left. Traverse the open pasture SSW as to two forlorn trees, there is no tangible path on the ground, but where a turf way crosses, well short of the far fence, turn right and follow this to a gate in the wall, right of a woodland enclosure. Entering Open Access land, hence the signboard, one may simply bear right by the deep limestone sink hollow to a gate, a matter of 100m. 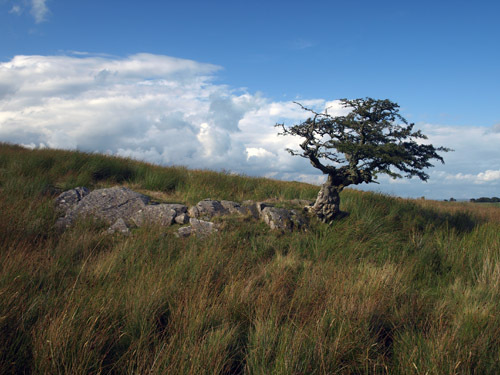 But you are recommended to take the opportunity to wander left parrallel with the wall to locate and examine a compact area of limestone pavement some 100m square then bear right to crest Berrier Hill. The handsome outlooks on the company of fells crowding by Blencathra alone make it attractive. Now is a good time to visit as if the wind turbines are sanctioned - against the good regard of the wider community - then this tract of upland pas-ture will be more than hostile for the appreciative walker, sheep will think twice about nibbling the sweet turf too, as the blades emit a nasty penetrating hum! Backtrack by the anotometer mast, recording average wind speed to inform West Coast Energy of the wind power potential. Backtrack to the aforementioned gate. Traverse the next enclosure on a long diagonal NNW, aiming for the plantation tip, the rough grazing has sheep trods to ease your progress. Nearing the far end find a thorn bush akin a Bonzi tree beside a low outcrop. Short of the plantation corner find a gate in the fence giving access to the next wild wet pasture. Bear left, the best going is not quite beside the forestry. There is tough grass and marshy moments, but nothing to impede the determined rover. Light birch growth surround the great pool of Gillcambon Tarn. Watch where you tread in its vicinity. 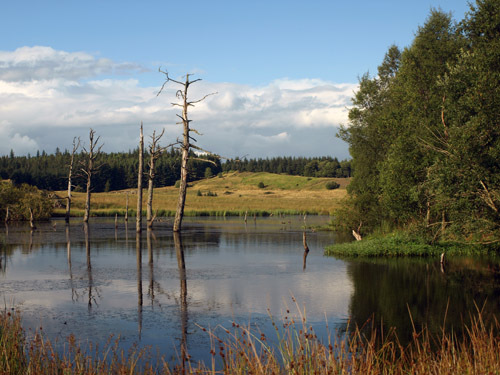 The tarn was constructed to provide a water supply for the Greystoke Castle estate. The dam has long since breached, hence the outer pool bristling with tree stumps. A quiet haven for geese. Curve round the west side of the tarn gaining a small outcrop, presently adorned with blooming heather. Venture on to the succeeding outcrop and then cross a shallow ditch to join a quad track leading left towards a third low outcrop. Step onto this passing the shooters’ marker, veering half-left off this in a ENE direction. The first six strides are more akin spongy wading, but soon this is overcome and the apparent marsh proves almost entirely dry walking. 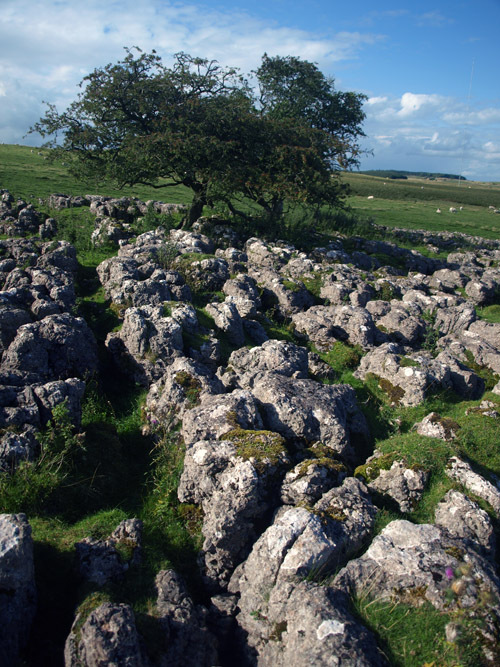 A quad track may be followed until slipping between limestone sink hollows a green turf path cuts transversely. Follow this right to reach a gate and Open Access signboard. Go through and keep the fence close left. The fence bounds the disused Parkhouse Quarry. Come to a gate and open track emerging from the old quarry compound. Follow this open track right threading through the breach in the low limestone scarp to reach the limestone bounding wall, following on right. Where this forks, take the right-angle open track threading back through a low element in the scarp, this curves left and advances to a gate. Go through and notice the old sheepfold left, surprisingly this was a sheep-wash. The waymark post shows two permissive path options. Keep ahead on the rising scarp edge to join and accompany the fence. Though before you do make a moments diversion down right to inspect the old limekiln. The platform on top looks like a gun emplacement. Appropriately if you look at the fenced kiln mouth you will see a notice ‘Armageddon Exercise 23’. Fear not the end is not nigh. This relates to an annual army exercise conducted in the valley below, at such time this includes a ropeway, reminiscent of Tarzan. Calling to mind Greystoke’s fictional link with Tarzan of the Apes! 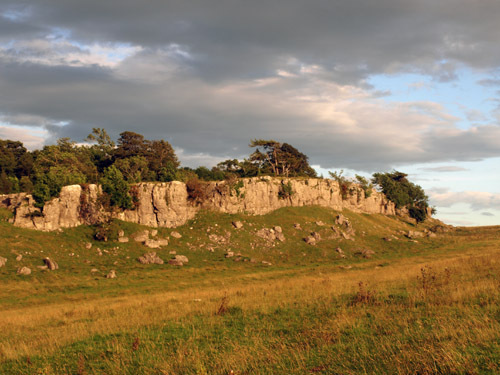 Follow on the springy turf upon the top of the scarp and as this drifts off the strict crest notice the line of hoary boundary stones pointing towards the limestone cliff, they may betray the line of a field division many hundreds of years old. The crag forms an impressive wall, known within the climbing community for its short tough moves. 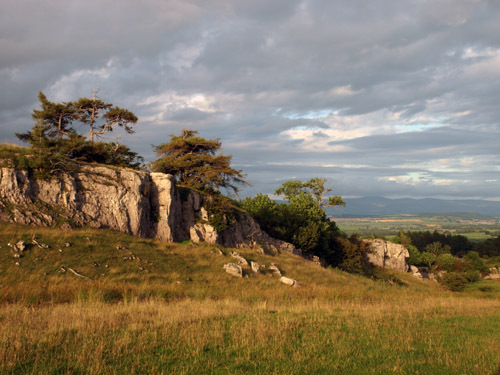 Coming to the far end of the scarp shelf admire the great views over Greystoke to the Pennines and south to the distant Westmorland plateau and nearer the fells rising above Ullswater. Bear off down the pasture slope with the wall left, coming to a galvanised gate/cattle-grid part-way down. Currently because of the imperative not to disturb the young pheasants loose in the young plantation, the footpath has been diverted right, down the slope through the two open mature oak coppices to join the track at the Sheep Hospital. By the end of the month (August) the permissive footpath will be open again and walkers will be able to go through and down the track in Old Nab Wood, slipping out at a corresponding gate and down the track to re-unite with the outward track at the dilapidated dutch barn.